Exceptional stabilization and support – features a full-metal folding bed frame with 4 extra durable legs with a locking brace for your safety, and a unique wire lattice base, to ensure no sagging at all. Luxurious memory foam mattress – featuring a premium 2.5 density rating for soft contouring comfort and the perfect amount of support. Our mattress is CertiPUR-US® certified and comes with a stylish and velvety-soft cover that’s removable and washable. 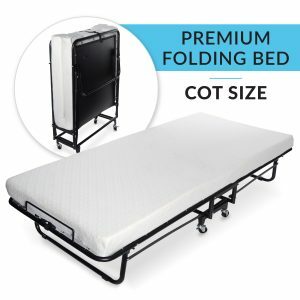 Ease of use – uniquely manufactured clamshell folding pattern secures shut with an adjustable trident buckle for compatibility with other mattresses or toppers. Easy assembly – assembly is simple and quick and includes all needed tools and a detailed instruction manual with pictures. The Milliard Diplomat Folding Bed is the result of extensive testing and valued customer feedback, with many common drawbacks among popular folding beds addressed and rectified. The super-sturdy wire lattice base coupled with our quality 5” memory foam mattress provides a unique balance between support and comfort, and the bed is also user friendly with its adjustable strap, pivoting wheels, buckle, and leg grips. Nothing has been overlooked. Too many folding beds have flimsy, thin mattresses, that provide no comfort support. We understand that you are looking for more and that’s why we designed the Milliard Diplomat Folding Bed around a 5-inch medium-firm composite memory foam mattress with a 2.5 density-rating. 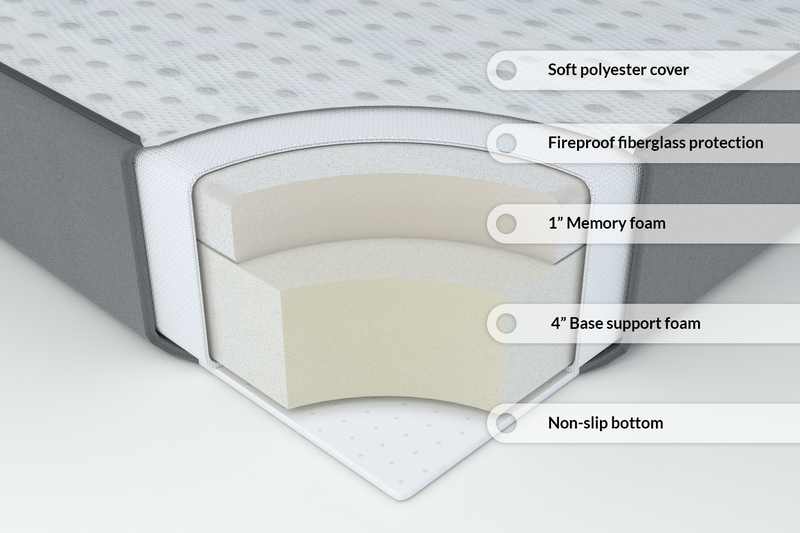 The mattress’s memory foam has an IFD rating of 12.0 and is encased in a washable and removable cover that meets federal flammability regulation standard 16 CFR Part 1633 without any use of any flame retardants. It’s firm enough to maintain a straight sleeping posture for back or side-sleepers, but soft enough to feel airy and light under the heavy points of contact at your shoulders, hips, and knees. Lie back, relax, and enjoy the soft silence of our memory foam without clunky springs to creak or poke, and feel positively diplomatic as you’re treated to a silky smooth removable cover that’s extra soft, extra convenient, and will leave you feeling extra rejuvenated. The Milliard Diplomat Folding Bed is constructed of premium high quality steel tubing with double reinforcement at the base that is durable and won’t bend over time to ensure a stable and durable platform that lasts. Our unique wire-latticed folding frame has minimal flex to let the foam do its job and eliminate the sinking feeling you might have from other folding beds. It keeps your back well supported and allows for a more rigid frame that’s free of unnecessary moving parts. Stabilizing legs at each end have locking braces to make sure no one goes bump in the night if they toss or turn, and the entire construction is overbuilt and counter-weighted. All this amounts to optimal support and a much longer service life than comparable designs. The Milliard Diplomat Folding Bed, was designed for storage. The bed features 360 degree pivoting casters to ensure ease of transport and maximum mobility. When stationary, 2 wheels lock in place for peace of mind, and our folding bed folds to just 14 inches thick for compact keeping. Nothing sours a purchase like getting a broken product right out of the box. If an item needs to be broken in, most of us prefer to do it ourselves! That’s why Milliard folding beds are double-boxed and bagged to protect your purchase during transit. We can’t adjust your package handler, but we can make our packaging more durable. Each folding bed arrives in a 40×23 ½ x18″” box that contains another box that contains your pristine folding bed frame and mattress, each bagged separately to keep them shiny and neat. We also understand that some package handlers are particularly athletic, so if your new product arrives in any condition other than ‘new,’ please contact us so we can make it right. Usable immediately however allow 48 hours to fully return to its original shape. Vacuum sealing sometimes traps odors. After unwrapping, allow mattress to air for a few hours to eliminate trapped odors.